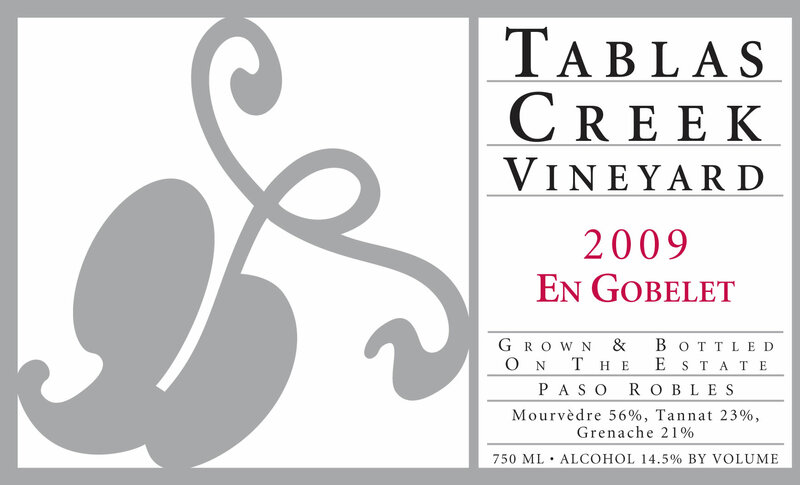 Read about the genesis of En Gobelet on the Tablas Creek Blog! If you’re interested in a more detailed story of how En Gobelet came to be, check out the post Creating a New Wine: En Gobelet on the award-winning Tablas Creek Blog. The 2009 En Gobelet shows a spicy nose of black olive, dark chocolate, menthol and blue fruits. The mouth is intensely powerfully structured with fig, briary fruit, pepper spice and a surprisingly creamy texture with fine, chalky tannins. The finish shows Tannat’s characteristic firmness but bright acids and lift from Grenache. Drink for the next decade or more. The 2009 vintage was our third consecutive drought year, with yields further reduced by April frosts. Berries and clusters were small, with excellent concentration. Ripening over the summer was gradual and our harvest largely complete except for about half our Mourvèdre at the time of a major rainstorm on October 13th. Crop sizes were 15% smaller than 2008 and 30% lower than usual. The low yields and gradual ripening resulted in wines with an appealing lushness, rich texture and wonderful chalky tannins. Grenache was harvested between September 26th and October 3rd, Tannat between October 14th and 18th, and Mourvèdre between September 30th and November 3rd. The grapes were fermented using native yeasts in open and closed stainless steel fermenters. After pressing, the wines were moved into barrel, blended, and aged in one 1200-gallon French oak foudre. It was bottled in May 2011.